I am a member of the Collective Bias™ Social Fabric® Community. This content has been compensated as part of a social shopper insights study for Collective Bias® #CBias #SocialFabric, all opinions are my own. There is such a thing as too much champagne. There. I have said it. Uttered the words that I thought that I would never say. I always thought that there could not possibly be such a thing as too much champagne, but there is. Ed asked me to marry him on our recent trip to Brittany. I was delighted to say yes! We came back home and the champagne started, families and friends all offered glass after glass of fizz and I am afraid to say that champagne fatigue set in. I am convinced this is only temporary. I adore champagne. I am on a coconut kick at the moment and for the last visitors Ed popped to the supermarket (photos here) and returned with Bacardi, coconut water, limes, the biggest mango I have ever seen (which sadly disappointed), some coriander and a red chilli to turn into coconut based cocktails. Coconut water is one of my favourite ingredients at the moment – subtely coconutty and very refreshing. 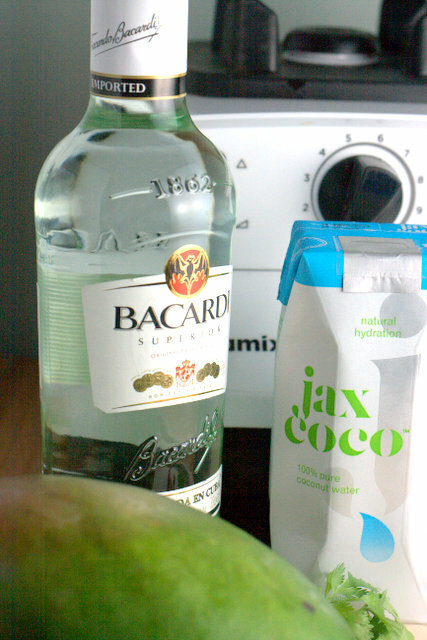 My cocktail was based on a Piña Colada – swapping mango for the pineapple and using coconut water in place of the cream. For a little added interest and a kick I added a few leaves of coriander and the tip of a red chilli. 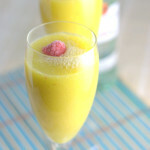 If you try this Recipe: Refreshing Bacardi Mango Coladas please tag #FussFreeFlavours on Instagram or Twitter. It is amazing for me when for me when you make one of my recipes and I really do love to see them. You can also share it on my Facebook page. Please pin this recipe to Pinterest too! Thanks for reading Fuss Free Flavours! 1 mango – peeled destoned and cubed – had I had more time I would have frozen mine. Place all the ingredients into a blender and whizz until smooth. Serve immediately and enjoy with friends. 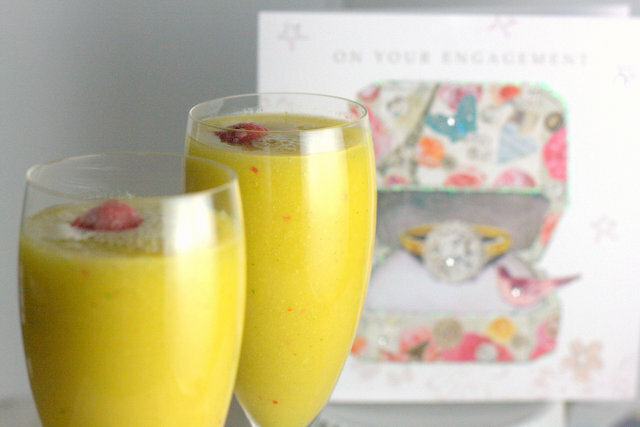 Serve in long stemmed glasses to maximise the potential to wriggle your newly adorned ring finger!